Have you heard of Boxdelux? It’s a new subscription box a la Glossybox, Birchbox and co, with the exception that this one is not allowing to be pigeonholed into beauty box! As you can see below, their very first box also includes some food like the Propercorn, the We Are Tea teas and the Nakd nutrition bars. 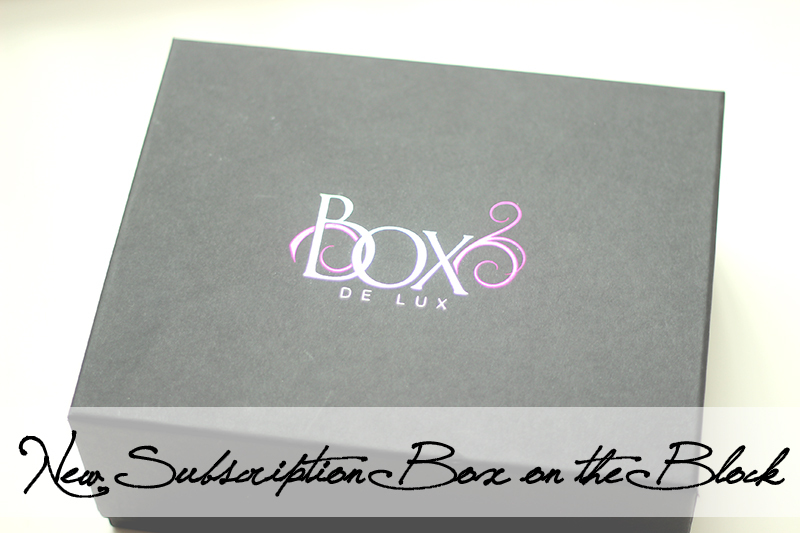 To maintain the exclusivity of the Boxdelux brand there will be a limited number of boxes available each month, and no repetition of products. Each product featured will be available to buy in the online shop for a limited period only. Upcoming boxes will also have specific themes: for example Boxdelux will be supporting Breast Cancer awareness with a percentage of the profits going to the charity. So if my maths is correct, the contents together are worth £92.05 in total. That’s a lot! As the box costs £35 per month (or £105 for 3, £175 for 6 and £350 for 12 months), the box is basically more than double its price in terms of value – which is a really, really good deal (order it on the Boxdelux website). You can tell that there’s a “but” coming, can’t you? Well, here it comes. Firstly, £35 is A LOT in my opinion. With other boxes you get almost 3 boxes for that price and they have actually featured high-end / luxury items too. Maybe not the full-size version and maybe not that many items, but they did do that too. Also, again, besides the Propercorn, I hadn’t actually heard of any of those brands. And while they might be luxury items, they’re still unknown to me. Paying a tenner or whatever for a box where you don’t know the products/brands, that’s fair enough, but £35 for that kind of gamble? I personally wouldn’t do it, but that’s because I can’t afford just shelling out £35 for something that I don’t know what it’s going to be like. But maybe that’s the German in me. But I just prefer spending £35 per month by buying something where I know exactly what I will get. I have to say that this is only my opinion. I’m not a massive fan of nail varnishes or lip glosses for that matter, I don’t drink green tea and I have way too many lip balms as it is. A SPF30 sunscreen sample will of course be useful for my trip to Cote d’Azur, but it’s not like a 15ml sample will go very far. 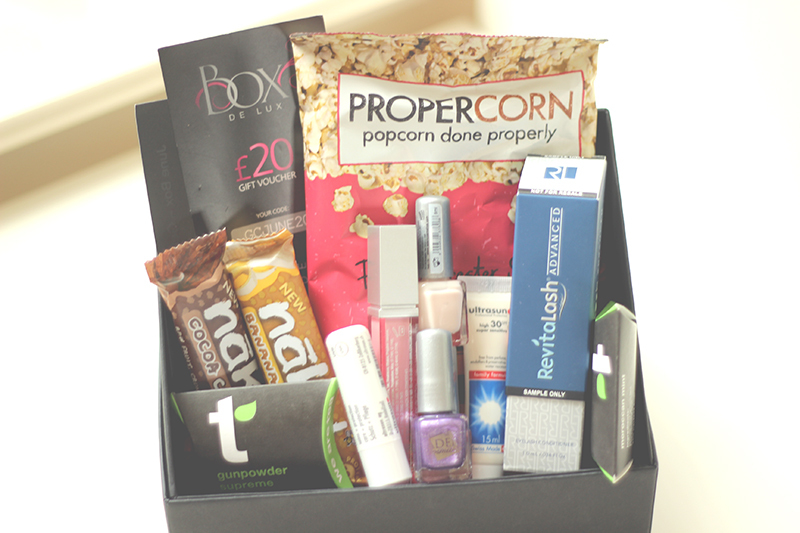 The only product I’m really excited to try is the Revitalash Eyelash Conditioner and the Propercorn (though I’m not a fan, the Worcester Sauce & Sun-dried Tomato flavour sounds sooo good!). I do like that the box will always have a £20 voucher that you can spend on the Boxdelux site on the products if you liked them. That IS a good idea. But I also can’t think of what to include in these subscription boxes to make them better. A luxury bodylotion maybe? Surely anyone could do with that? Or maybe a high-end mascara? I really don’t know, because we are so different and we like different things and it’s just hard to please everyone. ♥♥♥I don’t want to be nasty on Boxdelux, and I don’t want to come across as ungrateful for having received the box for free. I know I’m meant to be all ‘ohhh get this box, it’s awesome’ but that’s just not me. I’m here to be honest with you, to share my opinion. And in my opinion, this box is not my thing. YET. What do you think? Would you order this box? How would you improve subscription boxes? Thank you so much Chanelle ♥ Will you get the Box? I love that you’re honest. I dislike when people lie in their reviews, it’s VERY annoying!